Of all of the counties, in all of the battleground states in this election, there is only one who is still counting votes: Palm Beach County. If the name sounds familiar, it’s because this is the same county that played host to the biggest electoral debacle in the history of American politics during the 2000 presidential election. As you may recall, George W. Bush defeated Al Gore by one-hundredth of one percent in the state of Florida and he did so in part thanks to the implementation of a new butterfly ballot in Palm Beach County that caused the area’s geriatric populous to adopt an inexplicable fondness for Pat Buchanan. Luckily for the Democratic Party and our nation’s collective sanity, Palm Beach County’s votes didn’t mean a damn thing this election as President Barack Obama had the 270+ electoral votes he needed for re-election before midnight. Palm Beach County didn’t have the dubious honor of holding our nation hostage for a second election this time around, but just because their votes haven’t been tallied yet doesn’t mean they haven’t had an effect on the election’s outcome. Al Gore lost the Presidency by a grand total of 447 votes in 2000 and there are a million things that we can point at in retrospect as being the reason he didn’t win. The usual culprits include the butterfly ballot I mentioned earlier along with hanging chads, a conservative Supreme Court, and hijacked electronic voting machines. But, one of the reasons for Gore’s defeat that has faded in importance with the passage of time is the campaign of Green Party candidate Ralph Nader, who garnered nearly 3% of the popular vote nationwide. To say that Nader “stole votes” from Gore is patently ridiculous, especially coming from supporters of a party that only won the 1992 election because some spastic little Texan named Ross Perot received about 19% of the vote. However, it is not untrue to say that the vast majority of those people who voted for Nader would have cast their lot with Gore had the Green Party not backed him as their candidate. More important is the fact that there are 97,488 Floridians who voted for Nader in 2000 who now know that their vote very well could have been the one that kept George W. Bush out of The White House and helped change the course of American history. Beyond that, there are millions upon millions of people who saw what happened in 2000 and realized in ways that they never had before that their vote could swing an election. After that America’s on-again-off-again experimentation with third parties turned off again, with no third party candidate being able to break the 1% popular vote threshold in the 3 presidential elections since. It is only with this context that we can truly appreciate why the 2012 election was so particularly disappointing for the jumbled melange of supporters who make up the American left. 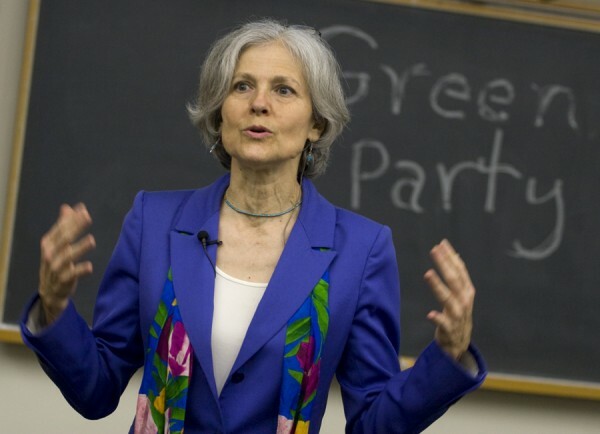 The current vote tallies have The Green Party candidate for President, Dr. Jill Stein receiving a little over 400,000 votes nationwide, constituting a vote share of .34% and a fourth place finish. Green Party supporters will (if you can find one) tell you that the election was a success, pointing out that Stein and her running mate Cheri Honkala tripled the returns of the two past Green Party candidates in 2004 and 2008. This is an entirely true statement that is worth next to nothing because the 2012 election marked the first time in 4 presidential elections that Ralph Nader declined to throw his hat in the ring. When you take out the 600,000 votes that Nader averaged over the previous two elections as an independent, it looks as if Stein and the Green Party underperformed this election, only gaining roughly half of the votes that Mr. Nader left behind, with the remainder presumably going towards President Obama or the menagerie of other like-minded third party progressives on the ballot. The candidacy of Jill Stein was, like those of her predecessors, an abject failure. For anyone to claim otherwise would be to argue that a performance that nets one-third of one percent of the vote is a success, which is beyond sad. And, please, I beg of you, don’t give me the argument that the Green Party was succeeding by getting its name out there and that the votes that were cast for their candidate were all about raising awareness and protesting the injustice of the Obama administration’s policies. If you want to protest, do with a boycott or a picket line and not with a ballot. I tried my damnedest on election night to find out how the Stein/Honkala ticket was doing and I never saw a thing because no one cares. Blame the mainstream media all you want, but it doesn’t change the fact that it is the medium through which 99.9% of voters get their information. Complaining about the unfairness of something that is consumed by that much of the general public is like a horse-drawn carriage manufacturer cursing the ubiquity of automobiles. I sincerely hope that this election has served to be the death knell of the Green Party and I say that not because I disagree with the party’s principles, but because I disagree with the party’s packaging. For all intents and purposes, the Green Party is like the Olympics: it comes around once every four years and for the intervening 47 months no one so much as gives them a thought. Their peak as a party was the 2.73% of the vote Nader got in 2000 and they’re never reaching that again. Once you lose momentum like that in politics, there’s no coming back. Everyone associates the Green party with Nader, if they associate with anything at all and the party has neither the resources or the wherewithal to change that. I’m not necessarily saying that the Green Party has to change its message, but I am absolutely certain that it needs to change its branding. There has never, and I repeat never, been an American Political Party that was based and marketed around a single cause that has been able to make the leap from also ran to legitimate contender. Founding a party around the idea of environmentalism is pretty much asking to be relegated to the kiddie table of electoral politics in this country. Did anyone else notice how climate change was not even mentioned once during the presidential debates and that no one seemed to mind too much? The environment is not an immediate concern in the majority of American’s lives because its damn hard to give two shits about global warming when you’re making $7.25 an hour or you’re coming back from your third tour in Afghanistan. I don’t care if both polar ice caps liquidate this summer and turns New York City into New Venice, the vast majority of the country will never even consider joining the Green Party because they don’t know who you are and, if they do, they think you’re a one trick pony. Who wants to trust a Green Party candidate to defuse tensions in the Middle East or reform our tax code? When Green is in your name, green is what you are and green is what you know. People don’t vote for green.